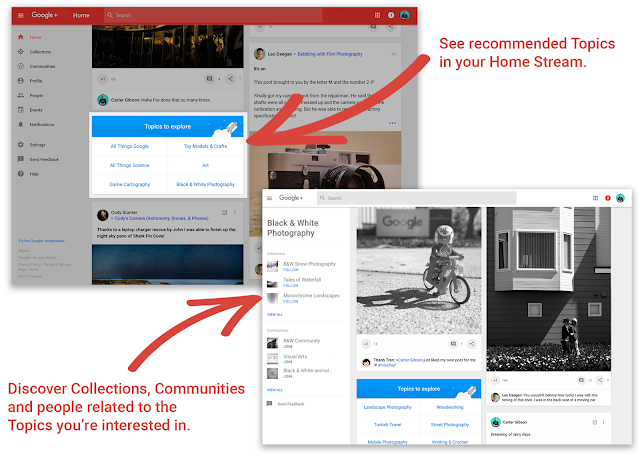 Millions of people use Google+ to connect around the things they’re interested in. To help you sort through the many Collections and Communities where people share, we’ve created a new feature called Topics. With Topics, you’ll see a high-quality stream of Collections, Communities and people related to things we think you’ll be interested in. Today, there are already hundreds of Topics available in English, Spanish and Portuguese, covering everything from black-and-white photography to hiking and camping. So whether you’ve recently discovered the wonders of woodworking, love gardening, or can’t get enough of street photography, there’s a stream of unique and interesting stuff waiting for you on Google+. To see the recommended Topics, head to your home stream and look for the “Topics to explore” cards. Topics will be rolling out over the next day or so, so don’t worry if you don’t see any suggestions right away.